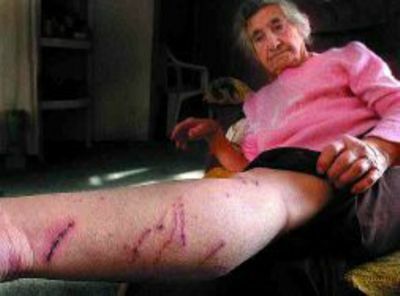 Ms Helen White shows wounds which wildlife believe were inflicted by a young black leopard in January 2003 in East Virginia, USA. There were scratch marks on the arm too but I didn't have time to photograph them. The bite looks a lot worse in real life than it does in the pic. Hi. I just got bitten by my cat Thursday night. My mom brought her dog over and my cat thought he was gonna kill the dog. He was not happy about the dog being here and was lunging after her. I thought I could pick up my cat and re-orient him to 'me' and then he'd stop charging after the dog. He sunk into my first knuckle on my right hand. I'm sorry I don't have a photo to share, but by 8 am the next morning it was already red and swollen. I have all four marks. I had to go to the ER to get a tetanus shot and they had to start an IV and run Antibiotics, take blood cultures from 2 different spots on my body, and they took X-rays. It was a 3 hour affair. They told me just before I left that I might have had to stay the night to receive IV antibiotics. I also got sent home on 875mgs of Augmentin twice a day. It hurts like heck. Oh, they also wanted me to wear a half cast until I can follow up with my doctor. I guess the movement of my wrist could help the infection to spread up my arm. I'd hate to see how they treat an elderly person or a person with a compromised immune system. I'm a 21 year old mostly healthy female. 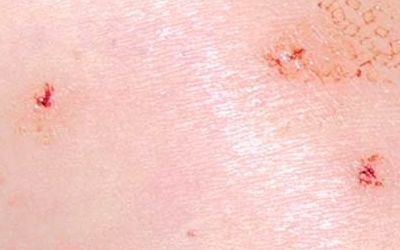 So, a cat bite is Serious. The ER docs said that people have even lose their fingers or hands due to them. Maybe you can put on your site how important it is to get to a doctor if bitten by a cat. If I was up to date on my tetanus, I wouldn't have gone. But it's more than just tetanus....as you can see. This email from Holly seems par for the course with cat-bites. Morag had to have similar treatment when Skye, then a two-month old wildcat kitten, and seemingly still friendly, bit her badly when she picked her up. She also bit me, but my system doesn't seem to react as badly. Somebody I know once thought he was going to lose his hand after being bitten by a wildcat. It's the only time he's ever been bitten, but his hand was swollen to around three times the size, and started to go black. The doctor told him that if the infection started going up his arm they might have to consider amputation! Cats, both domestic and wild, have an enormous amount of potentially infectious organisms in their mouths, which can be introduced into the human blood by a handy puncture wound. There are also a number of infectious organisms which we carry on our own bodies. These are often harmless unless they can pass through barrier that the skin presents, as in a puncture wound. I was bitten three days ago by my 10yr old pet cat in the muscle above the the knee. I ended up going to the Dr. and I am on Augmentin. I had no warning, except his food dish was empty, (he is on the mean side anyway and has bitten me several times, this time he hit the big time). It is very painful and I already had it moving up my leg and into my lymph nodes in my legs before going to the Dr. I should not have waited! My Tetnus was up to date, so that is why I didn't go at first, thinking it hit the muscle and it would be sore, but when it got red, a hard lump, and very warm, I knew I was in trouble! I am keeping a close eye on the cat now, who has all his shots, cause of my kids. If he keeps up the really aggressive, he will be gone. Many thanks indeed for sharing your experiences and your very clear photographs with us. They really are an excellent example demonstrating the importance of visiting the doctor after a bite or scratch from any animal. I wish you all the very best for a speedy recovery and hope that there will be no repeat of this kind of incident. I was going to try and find a pic of Max, to send to show how big he is. I was reading about a 36" wild cat someone had found, so I measured Max and he is about 2 inches shy of that from nose to tail. He lost about 3 inches of his tail 3 years ago in a screen door accident, so he would be all of 36 inches plus! And he is about 19 lbs. All white male. He try's to be a very dominent cat to me. He is a good looking cat, but a big baby in the house. Thank-God he is good with the kids!! My leg is better except for the lumps where the bite mark is, the Dr said it could take up to a month for that to go away. Just wanted to add a couple of comments to these pictures. I took my cat to the vet today. 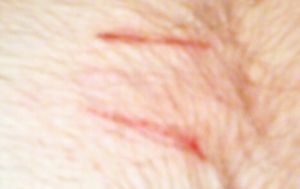 My normally sedate and very well behaved tabby wound up biting me during the examination. He's been sick and when the vet palpated his stomach which was sore he grabbed my hand before I could move. It hurt so bad I had tears in my eyes but I more or less blew it off. Until I got home and my hand started to be stiff and swollen. Anyway, a lot of stiffness, soreness, and an ER visit later I can honestly say I've never had a bite that was so painful... and which seemed insignificant at the time but turned out to be such a big deal. My dr. also warned me that if the meds didn't work, I'd wind up on IV antibiotics in the hospital. Lovely... 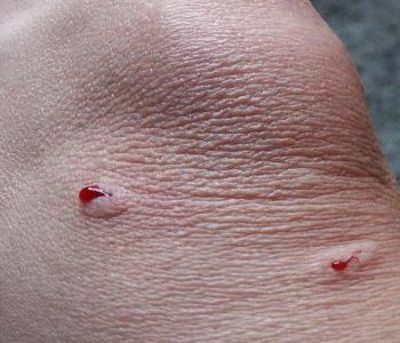 So, add my voice to the ones who said to take cat bites seriously, and no matter how wonderful or well behaved your cat is (mine hadn't done anything like this in the 10 years I've had him)...be aware that pain can cause the most docile of cats to bite. Two scratches, 28 mm and 32 mm long, starting off 15 mm apart and ending up 25 mm apart. 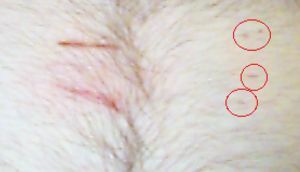 60 mm on from these were three puncture wounds, about 1 mm in diameter, and 16 mm and 12 mm apart. About 35 mm above and between the two lesions were a scratch 3 mm long and 9 mm above this a further puncture wound. 25 mm above that was a further puncture, about 2 mm in diameter. Unlike previous attacks, the mystery ends there as the culprit apparently returned to the scene of the crime a few second later. 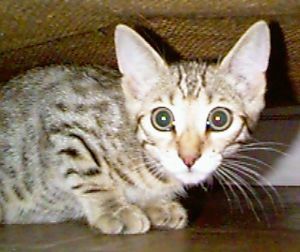 It was small kitten, about 8 weeks old, with pseudo-wildcat markings! From the fleeting glance he got of the animal, and the distance between the claw marks (15 - 25 mm) the victim assumed that it was much bigger than the tiny thin kitten that poked its head around the door and then started to race around the room again. 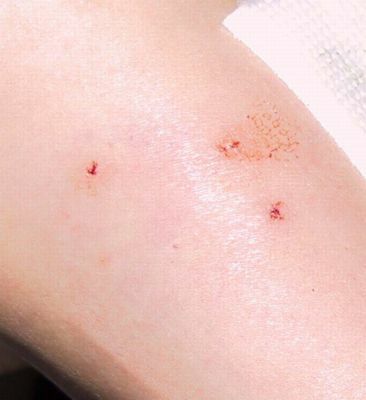 I think the details of the wounds are interesting. In this case it was clearly not an attack, just a case of the kitten using its claws for purchase it it leaped on and off the unfortunate victim's chest! A mixture of scratches and punctures, in twos and threes, rather than fours, and not at all in parallel lines. Augmentin is a brand name used in the USA for for a combination of amoxicillin, a penicillin-like antibiotic, and clavulanate potassium. It is generally used to treat bacterial infections of the ear, lungs, nose, sinus, skin, and urinary tract. Penicillins and beta-lactamase inhibitors are used to treat infections caused by bacteria. They work by killing the bacteria or preventing their growth. The beta-lactamase inhibitor is added to the penicillin to protect the penicillin from certain substances (enzymes) that will destroy the penicillin before it can kill the bacteria. There are several different kinds of penicillins. Each is used to treat different kinds of infections. One kind of penicillin usually may not be used in place of another. In addition, penicillins are used to treat bacterial infections in many different parts of the body. They are sometimes given with other antibacterial medicines. Some of the penicillins may also be used for other problems as determined by your doctor. However, none of the penicillins will work for colds, flu, or other virus infections. Penicillins are available only with a doctor's prescription.